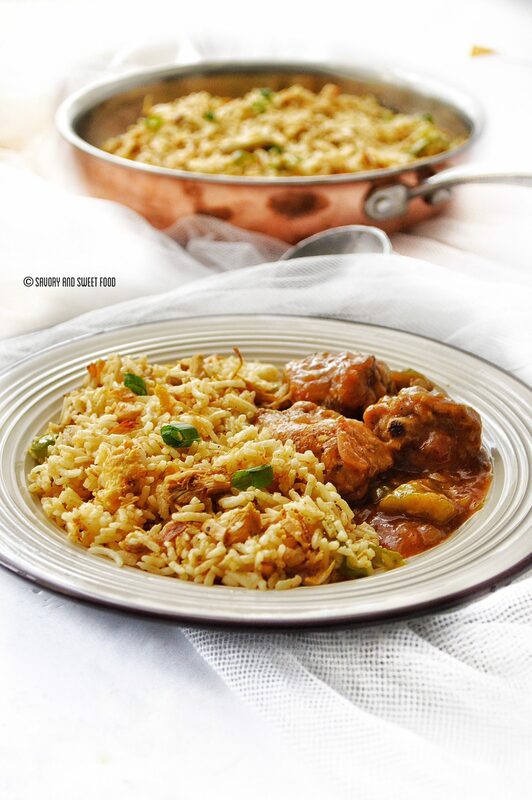 I just noticed that I have very few rice recipes in my blog. 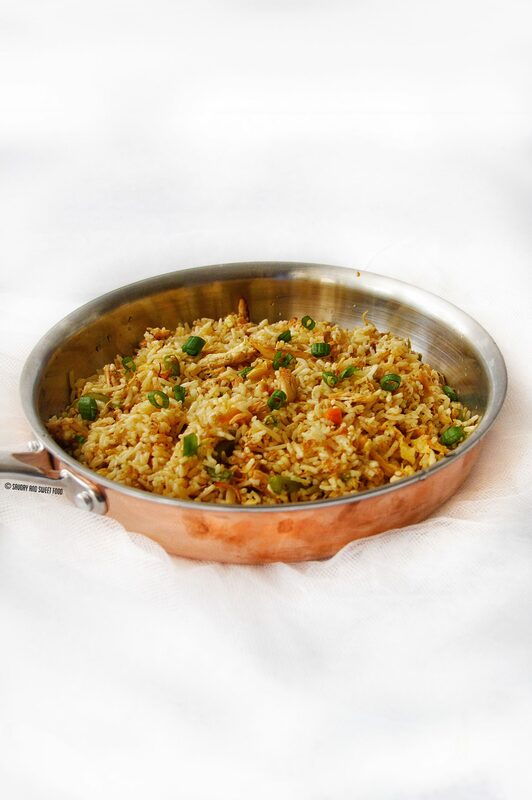 Time to change that, lets start with this delicious, better than take-out SPICY CHICKEN FRIED RICE! I was craving fried rice so badly, that I finally sat down and did some research on the internet. 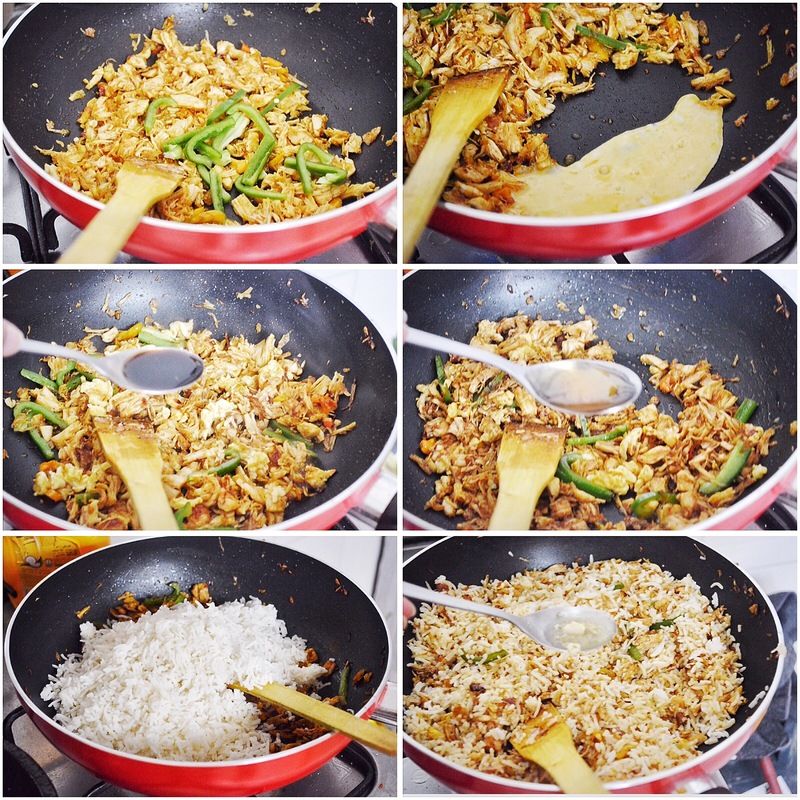 And there were soo many different types of fried rice that I got very confused which one to choose, and finally i decided to make an Indonesian fried rice, Nasi Goreng because it looked really really good. 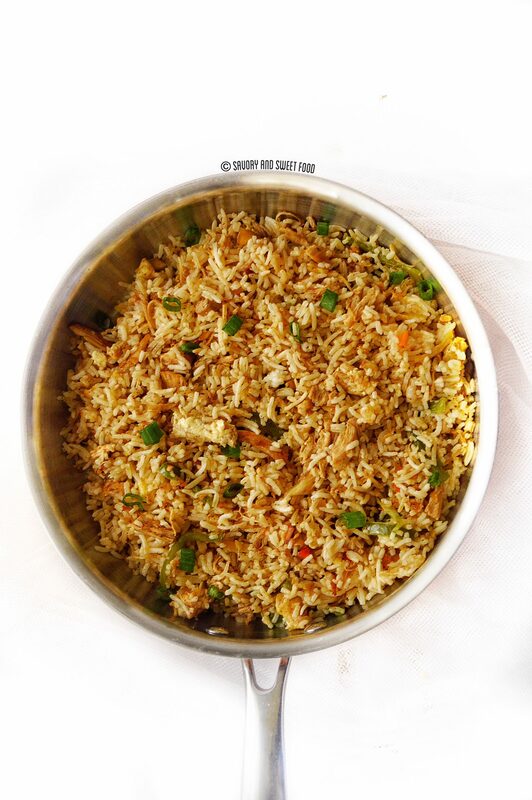 There are some things that you have to keep in mind for making great tasting fried rice. The most important one is to use cold rice. You will get great fried rice when you use cold left over rice. When the rice is cold it gets stiff and the spices gets stuck onto the rice really well. I made the rice a day before and kept it in the fridge. Butter is the best kind of fat to use in fried rice. Butter makes a huge difference to the fried rice. 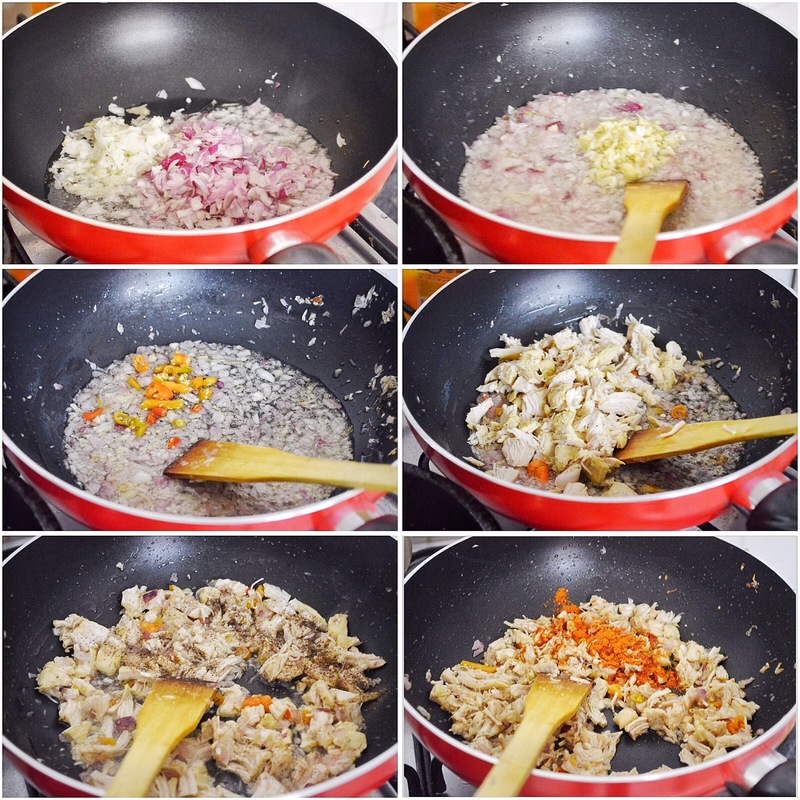 Pour few tablespoons of chicken stock to the fried rice at the end and sauté the rice on high flame for few minutes. 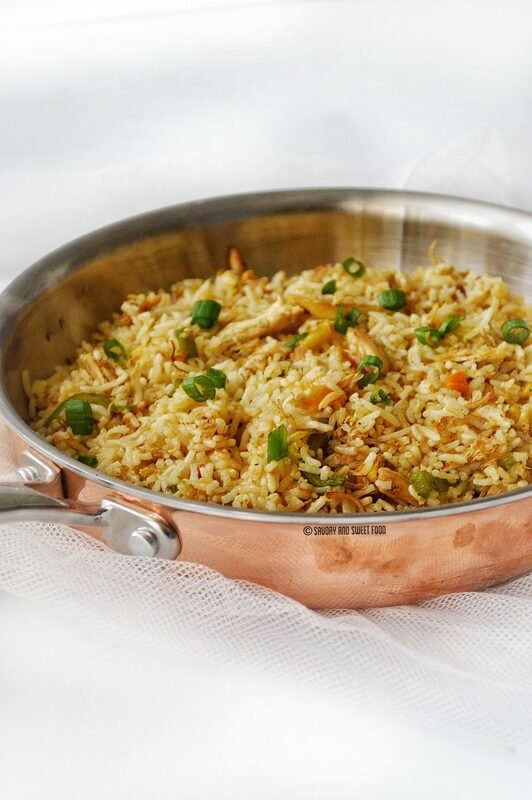 This gives a nice texture to the fried rice. You can add any sort of veggies in your rice, I didn’t add much though. ✔️ I cooked the chicken with a little salt and pepper. I used the left over stock to add to the rice. ✔️ This fried rice is spicy, you can adjust the heat according to your preference. ✔️ Use cold rice. 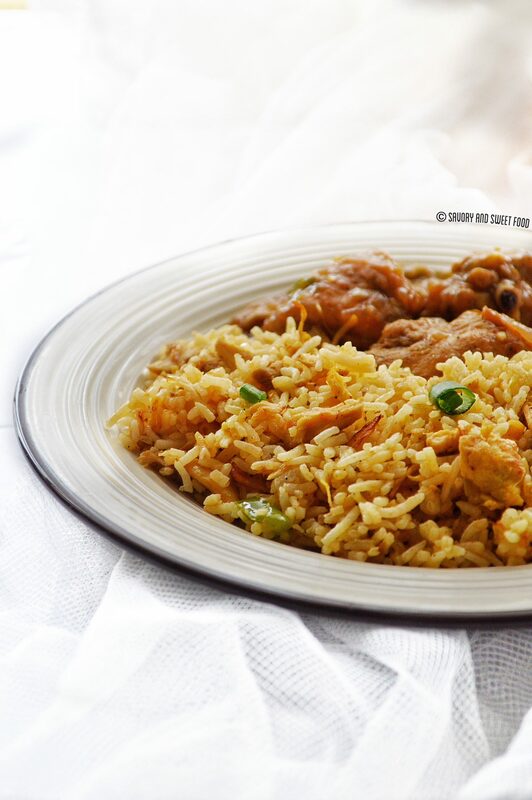 Make the rice a day ahead and keep in fridge. ✔️ You can add veggies like capsicum, carrot etc. Heat 4 tbsp of butter and add in the red and white onion. Sauté for few minutes. When the onions get soft add in ginger and garlic. Sauté for 5 minutes. Add in the red chillies. Mix for a minute. Put in the cooked and shredded chicken. Add pepper and red chilli powder. Fry the chicken till slightly golden, for about 2 minutes. Add in the capsicum and sauté till slightly soft. Move the mixture to the side of the pan and pour in the beaten egg. Scramble it. Then mix with the chicken mixture. Pour in soya sauce and honey. Add salt. Put in the cooked rice. Mix well. Pour the chicken stock and sauté on high flame for few minutes. Finally add 1 tbsp of butter. Garnish with the green part of the spring onion. A delicious, spicy, quick and easy fried rick packed with chicken flavor. Noo this is not Nasi Goreng, that’s made in a different way with different ingredients. I thought of making that at first but i altered the recipe so much and it turned out into this. 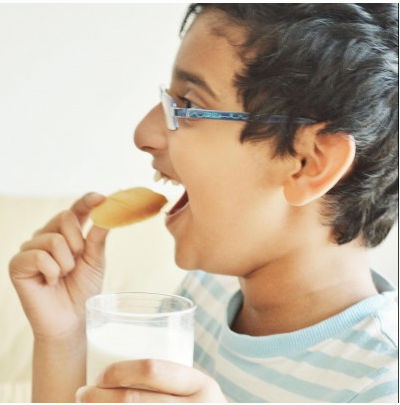 Try this, hope you will like it. 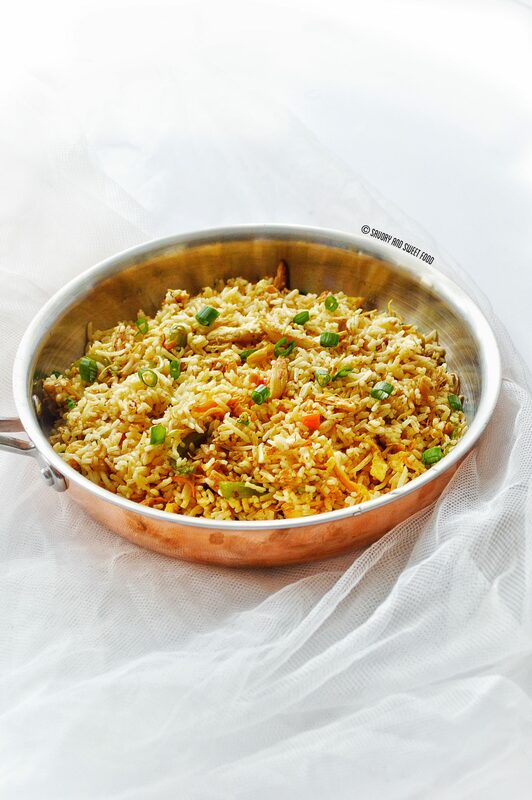 This fried rice looks yumm.. Just wanted to ask u.. Is this fried rice very sweet..? Because of the honey or is it normal. No its not sweet at all. Just add 1 tsp of honey. Hope the schezwan fried rice turns good for you. Let me know. Please send a picture if you can. Would love to see it. The schezwan fried rice turned out really yumm.. Loved it.. The schezwan sauce recipe is really good.. I have send you the pic in fb..
Heyy Jasna! Thanks for the feedback. Glad you liked it. Next try this fried rice. I saw the pic you sent, looks great. Thanks a lot!